The Mawas area is situated in Central Kalimantan. It is home to one of the last tracts of forest supporting wild orangutans. An estimated 3,000 wild orangutans and many other fauna and flora can be found in this area. The main aim of the Mawas project is to achieve the protected status of valuable peatlands through collaboration with the Central and Local Governments and the local communities. Not only is Mawas important for its biodiversity but the geological conditions of Mawas also make it a storage house of giga-tonnes of sequestered carbon. Over a period of 8,000 years, decaying plant matter from the swamp forests has built up 13–15 metre high domes of peat. The Mawas area holds an amount of carbon equal to roughly 30 years’ of Australian greenhouse emissions. The Mawas Conservation Program is a BOS Foundation program protecting 309,000 hectares of natural habitat for wild orangutans. Administratively, Mawas encompasses two main districts – South Barito and Kapuas districts – as well as five sub-districts and 53 villages with a population of 29,000 families. The Mawas peatland also sustains one of the largest remaining orangutan populations with an estimated 2,550 orangutans inhabiting the area. 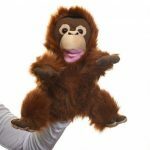 The Bornean orangutan (Pongo pygmaeus) is a Critically Endangered species and protected by law. 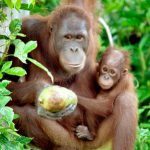 The Mawas Conservation Program plays a very important role in the conservation of this species of orangutan and its habitat, as well as in the conservation of more general biodiversity, environment and local community development. providing opportunities for local government staff to obtain scholarships (local and international) by conducting research in Mawas. BOS Foundation is all too acutely aware that there is no future for orangutans without protection of their natural habitat. We manage several habitat rehabilitation and protection programs through forest and natural resources management, which are designed to not only restore and safeguard critical land, but also to employ and encourage local communities to participate in eco-friendly sustainable activities. We actively organise many education and information sharing programs, whether in big cities or in areas surrounding our facilities. Education is an important means of communication with local and international communities, to increase understanding on the importance of preserving wild animals and habitats. School visits and programs, awareness campaigns, expos, workshops, teacher training and book publication are just some of the efforts we have made to improve awareness and knowledge on orangutan ecology and conservation. 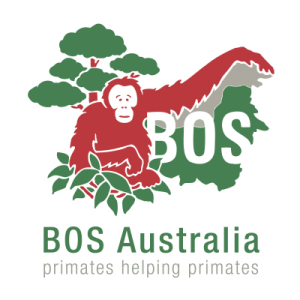 Aside from education programs, the BOS Foundation has developed, and continues to develop, relationships with national and international environmental organisations to help support the orangutan’s plight. 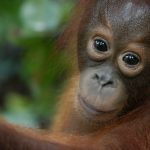 The BOS Foundation was involved in the development of Indonesian Orangutan Conservation Strategy and Action Plan 2007–2017 and continues to implement the plan, the core target of which is to stabilise orangutan populations and habitats between 2007 and 2017. BOS Foundation conducts many activities designed to increase the skills and capabilities in local communities, especially the sustainable management of natural resources, to ultimately empower them to develop their own economies, use the forest wisely and reduce local pressures on conservation areas.